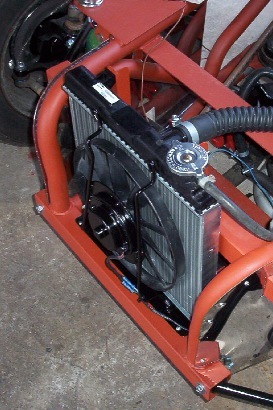 Whilst RHSC will supply a radiator with a kit, these are usually what has been available for them to buy at "Job lot" prices, and some members find that they aren't ideal for their application. 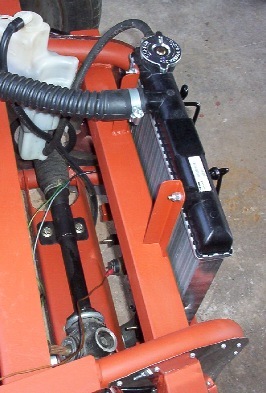 What follows is a selection of different radiators, that members have used, or alternative ways of making the RHSC supplied radiator more effective. 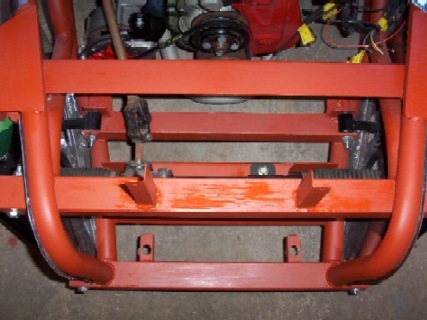 for the monocoque cars, the supplied radiator was a Cortina single row one, I changed it to a double row one, and still keeping the viscous engine fan, made a fibreglass cowl to fit. 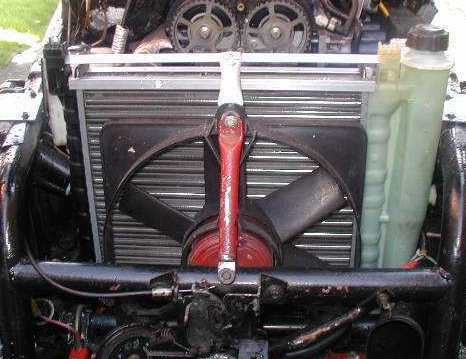 This proved effective, and was passed on to another member when I went to the Vauxhall engine. 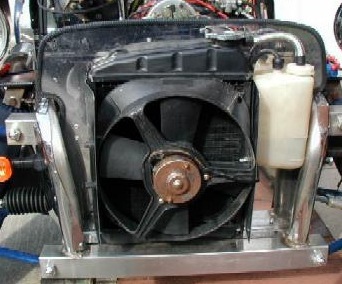 One of out North West members has fitted a mini radiator, complete with it's fan into the front of a wishbone 2B. Initial runs look encouraging, the big test will be the Le-mans trip this summer. 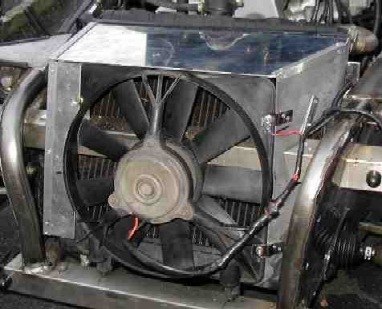 Here we have the supplied Cortina radiator, with a Citroen BX electric fan fitted into the nosecone, because you can't get the fan up close to the radiator, it has been cowled in. thanks to Steve Johnston for the photo's, who assures me that there is plenty of room under the nosecone. 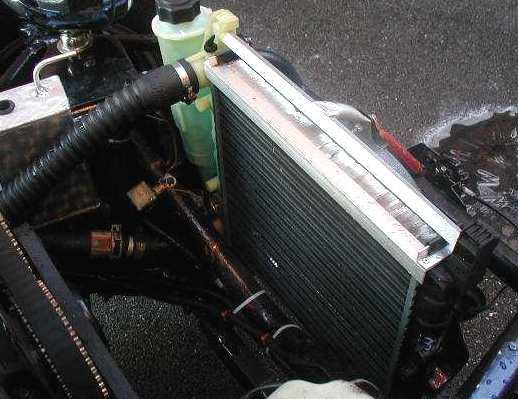 Here we have a rad that Colin King bought from Donington show, it's a 3 core ally job, with it's tank on the side, both inlet & outlet hoses come from that side as well. 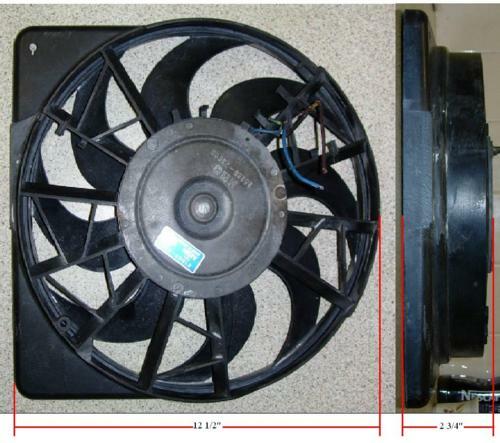 The fan is the usual Citreon BX job.